It's so nice when people treat you very2 nice when you least expect it kann? I'm so surprise and happy and can't stop grinning till now coz someone just give me something really really really special.. Its something that every woman craze (eh, ke crave?)!! Didn't expect it at all.. And i'm very verrryyy happy. It makes my day! oh no... not a day, I can say it's really make my year.. Despite all trouble, difficulties and sacrifices I've been through this half year, its really a pleasure when i've been rewarded with something I never expect and its bring so much joy and lite up all the gloomy & cloudy spaces in my life. Ahahaha.. its that special u know... Lucky me! Nak tahu ape?? Ask me personally la. Hehe, regret that I can't reveal it here.. Anyway, I'm so happy and nothing can take me down this week. Not even a pricey parking ticket, fussy pak guard, Messy MyVi, lost on my way to Bangsar, forget car key at office, forget to pick parking ticket from the ticket machine.. Haha..nothing can bring down my happiness now. apa la yang happy giler tu..
wow afzan, so easy to please eh? 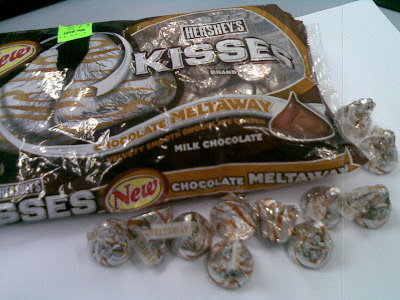 dapat hershey's kisses pun happy sampai mcm tu! ultimatecass@Atie-> bukan happy sebab dapat hershey's tuh. Tuh sekadar simbolik nye je. Sbenarnye mende yg dapat tuh sure lah lagi, lagi lagi best nyer!! tak terkate..
dpt transfer ke kuantan eh :D ? whatever it is bagus la awak happy2 sgt.